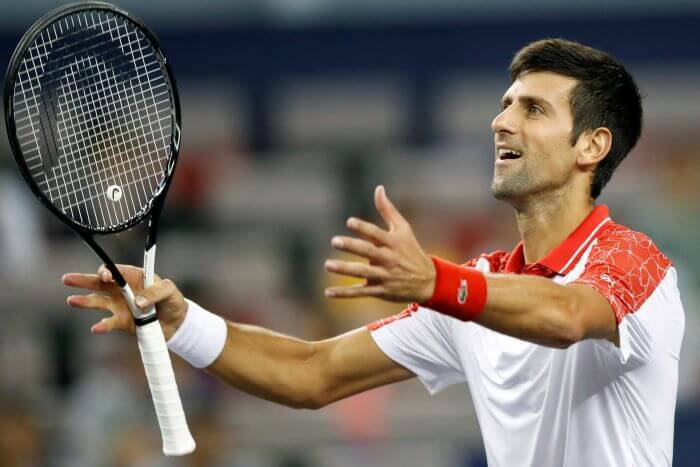 Shanghai (China): Serbian tennis player Novak Djokovic defeated Croatia’s Borna Coric 6-3, 6-4 on Sunday to claim a record fourth Shanghai Masters title, closing in on the world No. 1 spot in the Association of Tennis Professionals (ATP) rankings currently held by Spain’s Rafael Nadal. Djokovic, who had already secured the world No. 2 spot by reaching the final round here in Shanghai, had said on Saturday that his goal was to finish the year as world No. 1 and dethrone Nadal, who did not travel to China and continues to recover from injury, reports Efe news. The 31-year-old Serbian needed one hour and 36 minutes to beat Coric, currently world No. 19, who reached the final after beating the defending champion, Roger Federer of Switzerland, who in turn will fall to world No. 3 when the ATP rankings are released on Monday. After months of recovery from elbow surgery and a drop in his level of play that sent him tumbling down the rankings, Djokovic has recovered in the second half of the year to win titles at Wimbledon, the US Open and the Cincinnati Masters and now Shanghai. The final started out evenly matched until mistakes from Coric, 21, saw Djokovic up 4-2 less than half an hour into the first set, which he sealed after 38 minutes. Another mistake from Coric gave Djokovic the first game of the second set, but the Croatian fought back, particularly during a seemingly-endless third game that lasted 11 minutes, in which Coric saved four break points. Finally, the Serbian managed to win the tenth game and the set against an aggressive Coric, who has been the breakout star of the tournament, especially after defeating Federer 6-4, 6-4 on Saturday. This will be the first time Djokovic holds the world No. 2 spot since June 11, 2017.